I have an album that consists of 14 songs and two of them are singles that have different album art embed than the rest of album. Poweramp shows all of the songs with general album art and the embed singles art are missed. When I try to change those singles artworks in app, it changes all songs album art. What can I do to show those two singles embed album art? Within the Album view, you should see each track that contains embedded artwork showing it's own cover art. Same goes for the player screen when you are listening to music. Sounds like maybe the embedded art in those two tracks is not encoded the same as the others perhaps? I tried it: I selected all songs mode, then changed the album art for one song, then all songs from that album are shown with the new art. 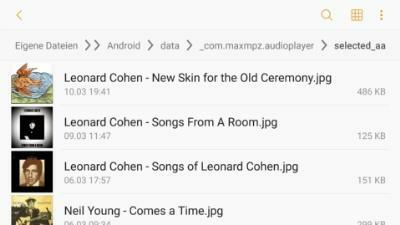 Try to remove the album art from the Poweramp folder selected_aa. Then the songs should appear with the embedded art. Technically, the ID3 tag format does not specify albums at all - any imagery is designated as referring to just the particular song in question (although admittedly that will often mean the same for all of the tracks in one album). For the heck of it, here's the list (I especially like $11). I wonder if any songs out in the wild even use half of these in one file? Try to remove the album art from the Poweramp folder selected_aa. Then the songs should appear with the embedded art. Thank you! It worked and now all songs are with embedded art. Problem solved.